The Telecaster is simple, unique and versatile, which is why it's stood the test of time. Today there are some fantastic cheap telecaster copies that at least stand up to the mid priced Mexican Fender Standards. A lot of guitarists get hung up on whether they have the "real deal" or not. Play any of the twangers below and you honestly won't give a rat's arse whose name is on the headstock. These Tele favourites, all under $500, have been selected based on consistently positive user and professional reviews (which you can read for yourself) and comments. Defining Features Classic Tele through and through with vintage tuners and bridge HSS pickup config. Suitable for modern styles. Coil tap. Versatile. Slimmer neck profile and lighter than standard Teles. Good project Tele. Some long time Fender fanatic comes up to you after your gig to comment on your killer Tele tone. He then notices Squier on the headstock. What does he do? Retract his praise in horror or swallow his pride and admit that Squier make consistently excellent guitars? The Classic Vibe exceeds all expecations. A cheap Telecaster only by its price tag, not its quality. The Classic Vibe 50s gives you that bright, chiming Tele tone, without the ice-picky harshness of some lower priced clones. Quality parts and construction and consistently well setup out of the box. Surprisingly few comments on any setup tweaks being needed. The Alnico 3 pickups give it that clean, vintage 50s sound yet the CV remains versatile enough that it positively snarls with a twist of the gain knob, retaining that mix-cuttingly deep twang. There are guys who have been playing Fender Teles (MIM and MIA) for over 40 years who are singing the Classic Vibe's praises. The dense pine body does a superb job of imitating the premium quality ash of some of the much higher priced USA Fender Standards, giving that naturally bright chime the depth it needs. So how does the CV compare to the Standard Squier Telecasters? No contest. It's definitely worth saving up that bit extra for the CV. While the Standard has very mixed reviews, it's difficult to find a single bad review of the CV beyond "ewww Squier" or some other pretentious nonsense. Note: Those who are looking for the same high quality Tele but with a rosewood fingerboard should take a look at the Classic Vibe Telecaster Custom. From Fender's Chinese factory, but don't let the C word put you off. The Fender quality is still there along with far more control over your Tele tone than with other reincarnations. The most versatile Telecaster in its price range. Across the forums, comparisons have been made between the Modern Player (budget Fender) and Classic Vibe (high-end Squier) series. More experienced players confirm the quality is very similar. The real comparisons, therefore, are between the features, with the MP offering a HSS pickup configuration with coil tap on the bridge humbucker. Naturally, this makes it a more versatile instrument, giving you classic Tele twang with the optional humbucking beef for heavier styles. The MP allows players with broader tastes to pull more tones than ever from that timeless Tele chassis. The slimmer neck and flatter fretboard radius support the modern feel. There are, however, a couple of vintage features, such as top-thread vintage tuners and a pine body (like the CV 50s), harking back to Leo Fender's proto-Telecaster Esquire models. Users are able to attain high gain metal tones with the humbucker - something most other Tele players wouldn't dare even try. But you still have the single coil bridge option with the split coil, the out of phase, strat-ish middle position, the jazzy, bluesy neck pickup and everything in between for some truly inspiring variation. For those of us with less than 200 bucks to part with, but insist on the consistently high quality of Fender backed axes, the Squier Affinity Tele is a solid choice. Simplicity, durability and of course great value sums up Squier's budget Telecaster offering. Couple of initial points - the body is slimmer than your standard Tele, so the axe is lighter and the neck is narrower than usual at the nut, which some have said is good for players with shorter fingers when negotiating those open chords. Bear in mind however if you usually play with 11 gauge strings and have fingers like sausages, the Affinity might cause some problems. Some users have commented on the pickups being a tad noisy, even for single coils, and many have chosen to upgrade the pickups. They don't sound cheap, but some feel they don't do the guitar justice. However, it does deliver that unmistakable "Tele sound" out of the box. Only personal preference will dictate whether you upgrade or not. Long time players and Fender owners have claimed the Affinity confirms the Mexican and USA Fenders are not worth the hundreds more you pay for the "real deal". Indeed, this is why the Affinity becomes a project for some experienced guitarists - with the right upgrades you can get them sounding closer to the American Standards than the Mex. That's not to suggest you must spend more on the Affinity to have a great sounding Tele. The general consensus is, for the price, "incredible". 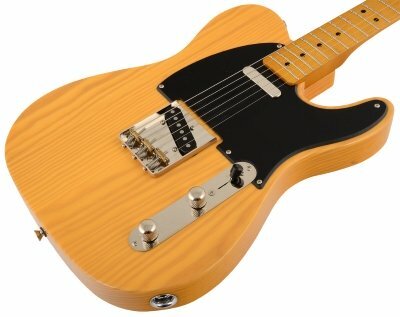 The Butterscotch Blonde / black pickguard combo (pictured) is an especially sweet option for such a cheap Telecaster.